Field camp is a fundamental part of undergraduate study and is a requirement of most undergraduate programs across the US. It is an intensive outdoor course that applies classroom and laboratory training to solving geological problems in the field. Skills developed during field camp typically include: collection of geologic data, constructing measured sections, interpreting geologic structures, taking notes in the field, and constructing a geological map. It is not only an academic experience, but also a true social, cultural and professional experience which shape the future geologist. The Department of Geology doesn’t offer its own field camp, but instead encourages students to select a field camp offered by other universities across the country that may be more tailored to their geologic interests. In this framework, a new collaboration has been established with the University of Franche-Comté (UFC, France). Dr. Lacroix and Dr. Kempton worked hard with their colleagues in France to establish the department’s first International Field Camp. K-State students can now enroll in this field camp through the study abroad program, which means that the students pay normal K-State tuition rates, keeping costsw down. 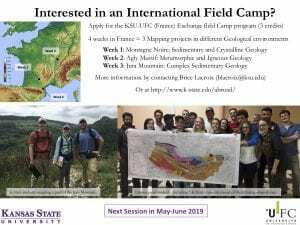 This field camp also allows students to not only apply the different skills and concepts of geology that they have learnt in class, but also to live a real international experience where they can work with French students (see promotional information below). The first week is located in the French Montagne Noire, where students map deformed sedimentary cover and crystalline basement. The second project is located in the South of France in the Hercynian Agly massif. This area is composed by metamorphic and magmatic rocks, intensively deformed. Finally, the third project is located in Eastern France. During this project students map a part of the frontal part of the Jura mountains. Three of our undergrad students, Mikaela Raeder, Keaton Lewis and Chuck Balkenbush, attended the first field camp in summer of 2018. This first “experimental” field camp was considered as a success from both KSU and French perspectives. Students and faculties particularly enjoyed the international and multicultural dimension. For the time being, this field camp is taught by French faculty members from UFC. However, we expect KSU faculty will be more involved and co-teach in coming years. 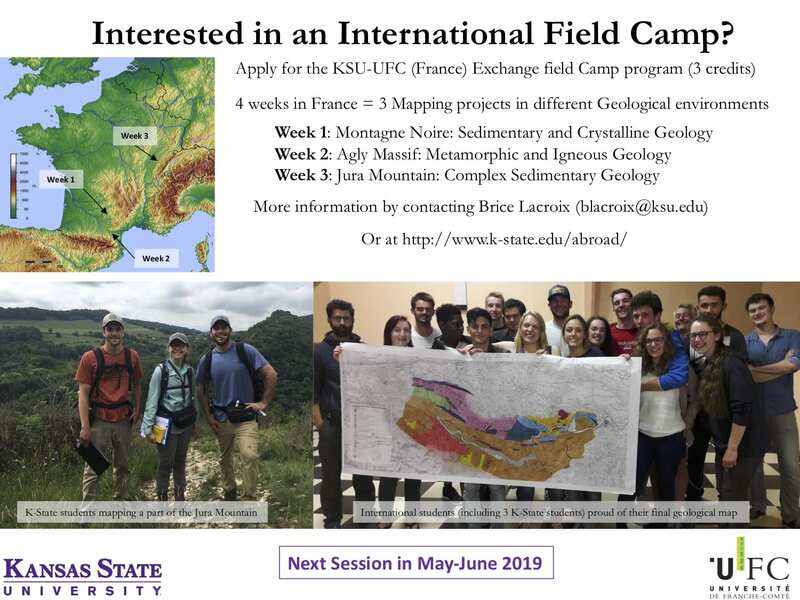 Further information regarding this field camp can be obtained contacting Brice Lacroix (blacroix@ksu.edu), or contacting the Education abroad program (www.k-state.edu/abroad). Partial support for field camp and other field experiences is provided to our students by the Elden E. II and Sylvia H. Leasure Student Field Geology Fund, the Frank E. Byrne Memorial Scholarship, and The Henry Beck Student Field Geology Fund. This support is gratefully acknowledged.